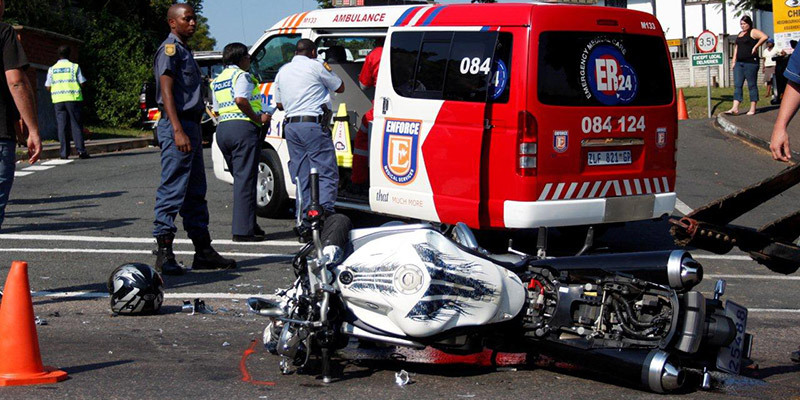 Riding in the Winter - Motorcycle Safety Institute of S.A.
Time for an ice-cold slap in the face! Here are a few chilling safety reminders for the winter months ahead. Not everybody has the luxury of heated grips and a nice snug faring, so keep these points in mind to extend your riding pleasure! Slippery Roads: The first rains of winter fall on roads that have been coated with oil during the summer months. Wet roads offer less grip than dry roads and places you previously rode could have a sheen of oil that now compromises the grip of your tyres. Water Filled Pot Holes: There is an illusion created by pot holes. Appearing like puddles, they conceal their depth…that is until you ride over them. Never assume a puddle is just a puddle! White Lines: The painted surface of white lines gets extremely slippery in the rain. Avoid riding to close to the centre of the road during rain, as these markings collect a lot of fuel and dirt deposits. Add directional arrows and manhole covers to this list of snags! Pedestrians: Be aware that pedestrians in wet weather are always not very aware, especially when running across the road to avoid getting wet! They usually keep their heads down to avoid the rain, so keep yours up to avoid them. Speed and Corners: Make sure the centrifugal forces on the bike are minimised heading into bends. Just ride a little slower, keeping those forces under control. Never sharply brake or accelerate to quickly either! Additionally, gearing down to rapidly could cause a lockup of the back tyre where it normally wouldn’t on a dry road. Tree Gum: Trees overhanging the road get a little over sapped during summer. In the winter rains the mixture of water and tree sap can form a slippery film, the perfect trap for the unwary motorcyclist! Corrosion and Your Motorcycle: Corrosion during winter can be avoided by washing of the salt and road dirt causing oxidisation. Wax your alloy rims with a nice hard wax to prevent the outboard motor effect. Try putting a little grease or vaseline in areas you think should stay dry. Remember, bike covers will actually get a little moisture underneath them, so keep your bike covered in more ways than one. Warm Yourself: Bear in mind that cold hands and feet don’t react well. Treat yourself to a warmer kit and beat the freeze up this winter. Cold weather presents unique dangers other than purely staying warm. The exposed nature inherent in motorcycling drives most people into a warm car or truck. For those who choose to brave low temperatures, cold weather riding can be a rewarding experience. Ice: Ice is an ever present danger when the temperature is below 5 degrees. Shadows can keep the road cool and moisture will freeze. If you hit ice, hope you are not in a turn. If you hit ice and you are going straight you have a pretty good chance of riding it out, as long as you don’t panic. Don’t change your speed and keep a smooth line. If you hit ice while turning, you will be on the ground before you know it. Sand and Salt: A winter of snow removal will leave patches of sand or salt on the road even into the summer. While the intent is to increase traction when spread over snow and ice, once the snow is gone, it gathers into piles on corners and on the centerline of the road and will cause you to lose traction; usually when you need it most. Falling Leaves: The winter makes deciduous trees lose their leaves. A layer of dry leaves will reduce traction, but mixed with moisture and cold weather it can be super slick. The temperature underneath a layer of leaves can be 5-7 degrees colder than the air above them, so ice is more likely. Mind-Numbing: The greatest danger of riding in the cold is what it does to your body. If you are not dressed well enough and your body temperature drops, your reactions will slow, your dexterity will decrease, and you will have lapses in concentration. Obviously you need all your wits to ride safely in any temperature, let alone with the additional unique hazards cold weather brings.